The word "vinegar" comes from a French translation for "sour wine". According to vinegar institute, vinegar was invented accidentally in the process of making alcohol. Did you know that May month is considered as "National Vinegar Month"? From centuries, vinegar is produced using many stocks like fruits, coconut, sorghum, honey, molasses, beets, grains and many more foods. 2. Alcohol is again fermented by a microorganism called aceto bacter to get acetic acid or vinegar. What is so special about vinegar? Vinegar is inexpensive and easily available. It is effective, non toxic and has a long shelf life with losing its strength. It is non toxic and does not pollute air, water or land. It is also a known effective and safe cleaning product than bleach, ammonia or any other fancy cleaning products available in the market. 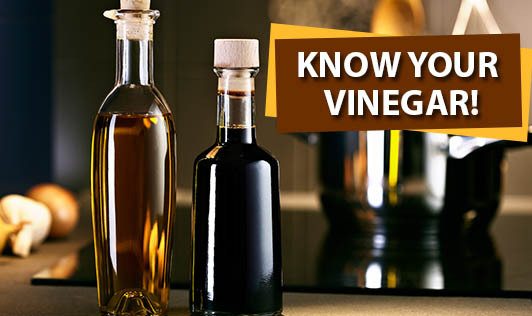 Apart from new specialty vinegar surfacing every year, there are a few different types of vinegars commonly available. • White vinegar: It is made from the wine of white grapes. • Apple Cider vinegar: Manufactured from alcohol obtained from fermentation of apples.